In the first three games of the 2018 NBA Finals, LeBron James scored 113 points, got a bloody eyeball, became a meme, and won zero times. He may very well be the GOAT, but only one player in this Finals has won the whole country tacos. So thanks for the free taco, Kevin Durant! We’ll all enjoy them in—what? !—six days? 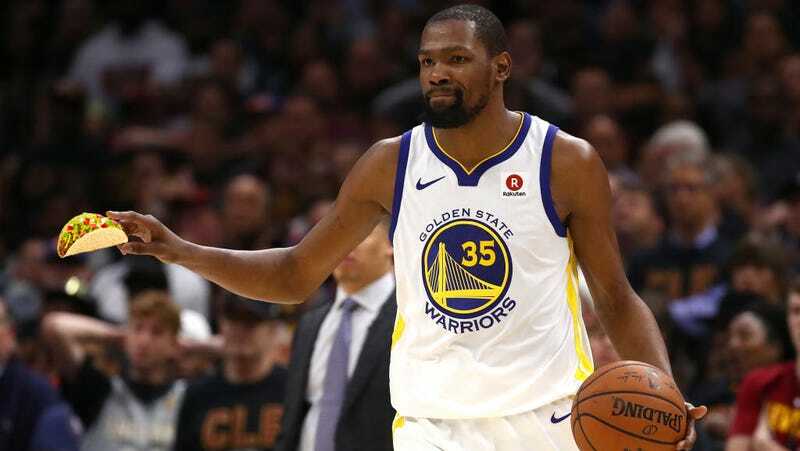 To be fair, Durant didn’t win the taco alone, he merely scored 43 of the 110 total points racked up by the Warriors (roughly 40 percent), while no one else on his team scored more than 11 points. Now the Warriors are up 3-0, and no team in Finals history has ever come back from a 0-3 deficit to win the series. But hey, anything could happen? Right? Whatever. The Warriors were in Cleveland, which means they (mostly Kevin Durant) “stole” a road game, and that means tacos! The rules are thus: Head into any Taco Bell on June 13 between the hours of 2 and 6pm, and you can get a single solitary Doritos Locos Taco for free. And there’s better news still, if you’re crazy for the Locos Tacos: if either of these teams wins on the road for the remainder of the series, there will be free tacos again, this time on June 20. All of this prompts a question, and it’s not “how on earth do Kevin Durant and LeBron James perform such superhuman feats?” It’s why the free tacos can’t be freely consumed until the 13th. Do they need to grow more Doritos plants to meet demand? Perhaps they require time to adequately prepare all those wee Diablo sauce packets. Or maybe they’re just hoping we’ll all forget that Kevin Durant won us all free tacos by then.